Note: this article originally appeared in RECORD 66 and is reproduced here by permission of the Industrial Railway Society. The article was published in 1976 and it should be noted that references to the current situation refer to the date the article was published, and not necessarily to the present day. For up to date information follow the links in the article to articles on each quarry. My interest in the narrow gauge railways of this area really started as a result of two short references  a note about a quarry line at Colwall in the Societys Bulletin No.144, and a paragraph about Beringtons Quarry at Little Malvern in RECORD 20, page 279. There seemed to be scope for some further investigation and, having friends in Colwall, I did not need much pushing! These notes do not pretend to be a complete history and to some extent are based on the memories of people who have lived and worked on the Malverns for a long time. As the Ranger to the Malvern Hills Conservators* once remarked, almost everyone who owned a shovel has had a go at quarrying on the Malverns at some time. Consequently, there are a great many small stone pits but I am concerned here only with the larger ones in which the transport of stone became a problem. Over the years some of the larger quarries have changed hands often, because the size of operations is strictly controlled by the ever watchful Conservators. The Pyx Granite Co Ltd, for example, first started working the quarry at Little Malvern, known as Beringtons. In 1909 when that quarry was nearing exhaustion, the Scar Quarry to the north was taken over. When this became unworkable because of the increase in size of the adjacent North Quarry, which was at a lower level, the Pyx Company was compelled to move its operations once again and started working a high level quarry above the Tank Quarry, which had been worked for many years by Mr T. Morgan. Similarly, when the quarry nearest the road cutting at The Wyche became life expired its owner opened a new quarry a few hundred yards to the north and slightly lower down the hill. The vinegar works was built in 1894, and is reputed to have been the first one in the Midlands. When the malting barley had served its purpose, the dross was taken in wagons down a 2ft gauge line to a piggery. 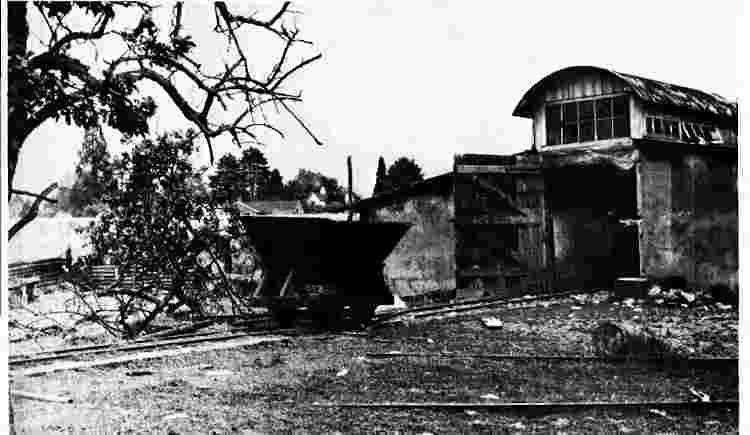 The railway was also used to take muck away from the piggery, and the track was extended past the piggery on to a tip. The motive power is uncertain. Some say that man-power was all that was used. There is, however, a noticeable rise towards the vinegar works which lends support to the story that a capstan was used. When the works stopped making vinegar the lower portion of the line was retained to help with muck removal, and remains so today. Another short length of 2ft gauge rail remains embedded in the road outside the vinegar works. The wagon at present in use on the line (herewith reproduced) is not an original item of rolling stock. It is of Hudson manufacture and came from an unknown waterworks. Little is known of the original wagons, but there survives one pair of wheels which came from an example with inside axle bearings. The diameter of these wheels is a mere six inches. Belmont Brickworks was owned by Mr J.C. Wilson in the early years of this century. The workings were of some size and by 1897 they employed five men under cover and thirty outside. Due to the rapidly enlarging pit workings the lower incline out of the deeper pit had been swept away by 1905. The works was remodelled in 1910 and its output can be gauged from Mr Frank Holl’s recollection that when he was a road engine driver he would take out 6,000 bricks a day to one site alone. To move this tonnage two engines would be 'doubled up' for the stiff climb up through West Malvern. It has proved difficult to establish many precise dates in connection with this system  also known as the West of England Quarries  mainly because animosity between the quarry owners and the landscape preservationists over the years has resulted in many of the original documents being destroyed. The schematic map shows what I have been able to determine from available information. 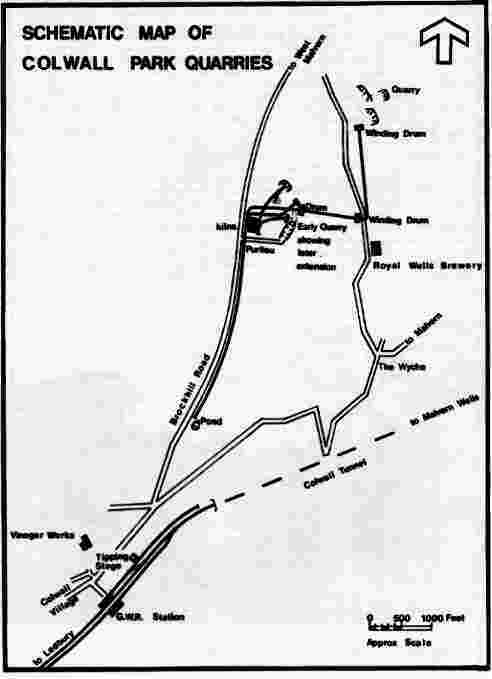 The line descended an incline from the quarry until it reached the road near to the Royal Wells Brewery. It is relatively easy to trace the lower part of this incline but the upper part was obliterated when the Conservators landscaped the quarries in recent years. There is, in the Conservators records, a photograph of this incline which shows it to have been a three-rail arrangement working on the self-acting principle with one winding drum above the rails at the summit. Near the brewery the line turned sharply to cross the road and immediately descended through Park Wood to the foot of the hills. The earthworks can be clearly discerned amongst the trees. A plan forming part of a family deed dated November 1909 clearly shows two incline drums on this section  one at the summit and one halfway down. The lower of these two drums was situated at a bend in the run which can be seen in the woods, and the location of the upper one is easily found because the owner of the house 'Monellan' has built his garage on its foundations. At the foot of the incline the line turned sharply to the left and ran alongside the Brockhill Road, newly built in the 1890s. The line did not, however, run all the way to Colwall Station. The quarry owners were restricted to building their line entirely on land leased from the Barton Court Estate and had no authority to cross the public highway. Consequently the railway stopped some hundreds of yards short of the public road from The Wyche down to Colwall village. Here, near a pond, there was a wooden derrick by means of which the wagons were lifted and their contents tipped into road trailers. The trailers were then towed a short distance to a tipping chute in the yard of Colwall Station, just behind the Schweppes factory. The chute is still to be seen today. Just why the stone was not brought by road all the way from the quarries is uncertain, but the steep and sharply curved hill down into Colwall probably made road haulage throughout too hazardous. It is not certain just when the line was built. An editorial comment in the Malvern Gazette of 24th May 1907 indicated that at that time the quarry was only just being redeveloped by Mr F. Pottinger and the railway had not been built. However, it was laid down before November 1909, and earIy in 1910 Pottinger floated the Colwall Park Granite Co Ltd to take over his quarries at Colwall and nearby Mathon. Later that year the quarry owners had a disagreement with the Conservators about their line which crossed the Purlieu, a lane over which the Conservators claimed rights of stewardship. On 5th September 1910 the Ranger of the Conservators served notice on the Company to remove that part of the tramway which crossed the Purlieu. Although the Company disputed the Conservators rights of jurisdiction, they compromised on 10th September by agreeing to make an annual payment of £2 for way leave. Details of the rolling stock are hard to come by. The fact that the wagons were tipped bodily implies that they were not V-skips and early photographs of the quarry show wooden bodied wagons. It is probable that V-skips were used within the quarry, possibly even down the incline (to serve the lime burning kilns  TJL), and this practice continued after the rest of the system was abandoned. The body of a V-skip remains amongst the waste tips which have been landscaped. There was a locomotive to work the comparatively short length of the tramway from the foot of the hill to the pond, for Mr Harry Pedlingham can remember that when he was about ten years old there was an accident involving a locomotive at the incline foot in which a mans leg was severed. However, I have been unable to find any positive proof of the identity of this locomotive. 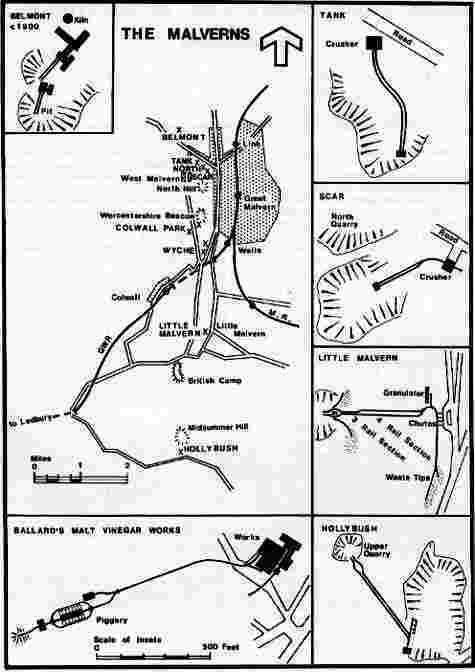 Even the gauge of the line is in doubt, and whilst 2ft gauge track may have been used for the internal system within the quarry it does not appear to have been the gauge of the 'main line'. A surviving photograph shows the gauge to have been wider, and nearer 3ft gauge than 2ft. According to the note in Bulletin No.144, the line which ran alongside Brockhill Road was lifted before World War 1, and road haulage with traction engines substituted. The demise of the incline down from the quarry appears to have been early. Perhaps road transport throughout was found to be practicable after all. 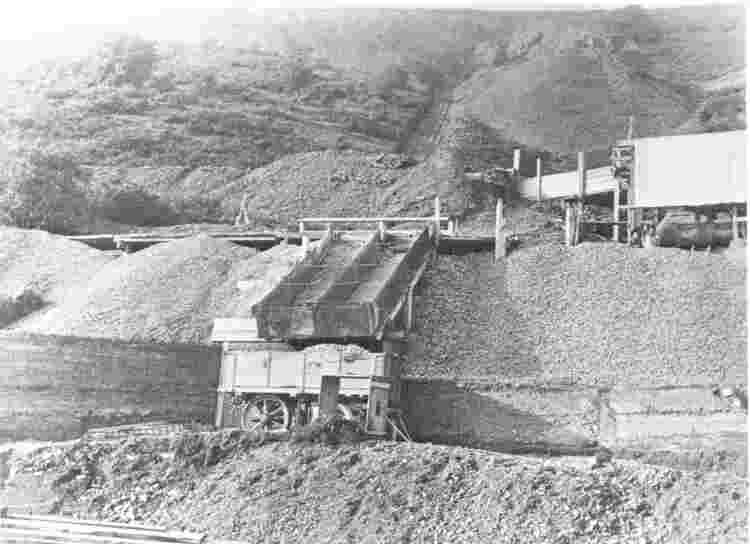 One of the principal causes for the closure of the inclines was the extension of the Purlieu Quarry, which cut through the route of the lower incline just below the winding drum. At some time after the lower incline fell into disuse another incline was opened from a small quarry located at the head of the Purlieu Quarry. This new route crossed the path of the old incline in a cutting some ten feet below the older level and apparently led out on to the Brockhill Road as before. At a later date still, this incline was cut by another route which ran from yet another small quarry on to the top of some lime kilns**. The kilns were made of massed concrete, as were the chutes in the yard and the bases for the machines in the quarry. Details of the closure of the quarries are given later under Wyche Quarry. Hollybush Quarry, located at the extreme southern end of the Malverns, is still producing a limited amount of stone today. The quarry consists of two distinct pits at different levels, and there was once an incline to bring stone down from the higher level. A steep roadway now performs this task, and its construction has destroyed the upper part of the incline earthworks. Traces of the lower part of the incline survive, as does the body of a 2ft gauge V-skip, possibly of Hudson manufacture. This quarry, known locally as Berington’s, was situated high above the road at Little Malvern. It was opened about 1880 but remained a small concern until about 1908 when it passed into the hands of the Pyx Granite Co Ltd. When the railway was laid is uncertain, but it possessed a substantial self-acting incline. The tracks passed on either side of the winding drum, the base of which, some 6ft square, remains today. The lines then joined to make a three rail section and passed through a narrow cutting, after which they separated to form a conventional two track incline. At the foot of the incline the rails curved very sharply past a stone retaining wall, built at a radius of about 9ft. Curving through 180° past the crushing plant, the line emerged facing the opposite direction and several feet above the road. There were three wooden chutes (later replaced by two steel ones) for discharging the stone into road vehicles below. The chutes were not directly over the road, but rather over a lay-by alongside the road, and the road engines often had problems in manoeuvring the trailers into position. According to the notes on page 279 of RECORD 20, the lower section of line from the crushing plant to the chutes and waste tips was hand worked. 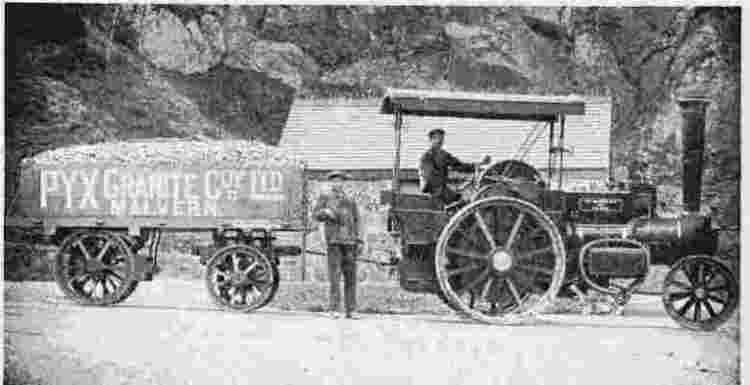 Most of the stone was taken by traction engines to the GWR station yard at Malvern Wells. At one time the Pyx Granite Co Ltd had one Robey and two Burrell engines here, plus two Burrells at Scar Quarry. One of the Scar engines came down to Berington’s one day and had a collision with a motor car. The car was driven away, but the Burrell sustained a broken axle! The engines were not very popular with local residents who objected to the 'ploughing competition' which began as soon as rain softened the road. The climb up from the Wells Station across the Common was hard going, and at least one driver was prosecuted for making excessive smoke. He admitted that he was obliged to build up his fire before making the climb, and it was inevitable that the engine would make smoke. At an adjourned hearing, Mr Aveling gave evidence that the engine was 'the most perfect' at consuming its own smoke . but then, it was an Aveling engine. The driver lost his case. In 1929 the Pyx Company was bought out by the Conservators solely for the purpose of closing down the quarry. The rail system here consisted of light track using V-skips to carry stone from the quarry face to the screens, from which it was directly loaded into road vehicles. The rail layout naturally changed as the quarry grew in size, but in the early days the layout was unusual in that one line ran round the foot of the face and was connected to the screens by two radial lines (rather like ribs on a ladys fan). The V-skips were of at least two different types, one having the upper lip of the skip body reinforced by channel section of quite heavy cross-section. Although there was a quarry here by 1905, Scar Quarry does not feature in official quarry returns until 1907. Its expansion was rapid, and in 1908 it employed 29 men. A length of 2ft gauge jubilee type track still remains in the quarry, half buried by a rock fall, the rail weight being approximately 15 lb per yard. As elsewhere, the layout within the quarry varied as the face receded, and I have not attempted to show it on the plan. The permanent system consisted of a double track incline from the quarry down to the crushers, located high above a dead-end road. The quarry was owned in its early years by Mr T. Morgan, but it appears that the incline descended from a higher level and it may not have commenced operations until the Pyx Granite Co Ltd took over. The course of the lines in the quarry has been destroyed by later working, and little information has been uncovered other than that shown on maps of the area. This quarry is right alongside the road about one hundred yards north of the cutting which carries the road through the crest of the Malverns. Within the quarry there was a 2ft gauge system upon which were employed hand-propelled V-skips. The skips were also used to carry stone from the screens to road vehicles, with a spur running on to a raised stage at right angles to the road. One photograph shows stone being tipped into a road lorry from a V-skip wagon which has a screw handbrake on a vertical shaft mounted on a frame at one end. One of the original concerns of the Malvern Conservators was that Wyche Quarry and Colwall Park Quarry might both be worked to such an extent that they would eventually meet, thereby causing a nasty gash in the famous outline of the Hills. The Conservators succeeded in preventing this by purchasing the Wyche Quarry first, and CoIwall Park Quarry later, and simply closing them. In the case of the latter, however, the owners did not sell out to the Conservators until the quarry was economically worked out anyway. I end these notes with a fascinating 'might-have-been'. In 1910 it was proposed that a passenger-carrying funicular railway be built up the eastern slope of the Hills from Malvern to the summit of Worcestershire Beacon, which is one of the best viewpoints in the Hills. Those who wished to preserve the natural beauty of the Hills were strongly opposed to the scheme, but there were others who supported it as a valuable commercial attraction. The Light Railway Commissioners met in Malvern on 18th July 1910 and expressed favour for the scheme, but it all came to nothing. Finally, I would like to acknowledge the assistance of Harry Pedlingham and Frank Holl, the Ranger and the staff of the Conservators, plus staff at the Council Offices in Malvern, the Malvern Library and the Records Office in Hereford. ** The rock on the western side of the Malvern Hills is limestone and for many years stone has been burnt hereabouts. The Malvern Hills Conservators are an independent non-governmental statutory body working under the Mills Hills Acts of Parliament of 1884, 1909, 1924 and 1930. They maintain all the open hill and common land under their control using funds levied on the local taxpayers and also revenue from other sources such as car parking. All car park provided by the Conservators are Pay and Display and one ticket is valid in all of their car parks, See www.malvernhills.org.uk for their web site.